Best system I have ever owned. This is by far the most versatile, trustworthy and reliable system I have owned. I let my dogs range at night and early in the morning. Early training required the use of a beep and a shock. The units versatility allowed me to add a beep and a vibration instead of a shock to get the response I needed. At night, the flashlight option comes in handy. Trustworthy to three quarters of a mile in a neighborhood,. An added bonus is the barking limiter. All this In one collar. 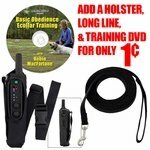 Easily worth the money in the long run, especially if you want to protect your dog. It has taken me a little while to get acquainted with this model. I had the old pro 500 for a number of years. This one is lighter, and I really like it. I will keep it!! I have a bullmastiff that came to us by way of a relative not being able to keep him. He is not mean but determined. He would take off on his own. Walks around the farm and beyond. The collar got his immediate attention. I put the collar on, and I seldom have to use it. He knows when I call to come now. Simple to use, even with 2 dogs. All functions are handy, even the lights. I love this product! It's a must have when you have a young dog and your time to work with him is limited. You can get their attention quickly and get the most out of your work time, without being cruel or harsh. I would recommend it to a friend. So far so good. I have really enjoyed seeing the dogs come around during their training with the Garmin. It is much improved. I have a tri-tronics pro 500 dual and classic 70 dual. The features are great and the Garmin 550 is much better. Gun Dog is fast and very good for customer service. Great doing business. Works great. Havent had them long but so far great. Great service from GDS. Only had the PRO 550 two weeks. No complaints, easy to use for two dogs, and really like the tone and vibrate features. I love all of the different settings, and it's easy to work with both dogs on one remote. I immediately noticed (within 30 min) my dogs positive response to commands using this device. Excellent -- I highly recommend this product. We love it. Our dogs work very well with it. Being able to turn the light on and off makes it easy to find them in the dark. Great product, I have two young Labs and it is really speeding up the learning process for them. So far, so good. The REAL test will come when I start using the system for salt water duck hunting in a few weeks. If something changes, I'll update the post. So far, though, this system has performed flawlessly with my two Chesapeakes. 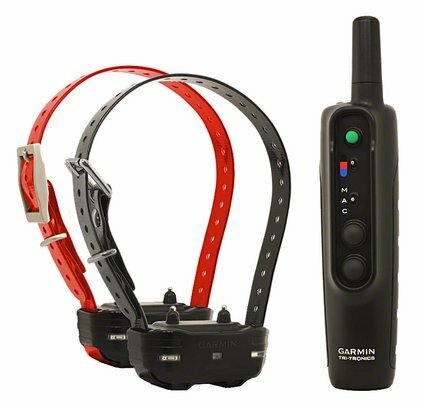 Works as well or better than our previous Garmin Pro training collar. No issues with both dogs swimming multiple times a day in the pool or pond. The charge is long lasting and the charging connectors are better than the previous generation. The buzz, tone and light features are handy compared to the previous generation tone only option. Finally off backorder. Glad to get. Only comment I have for Garmin is I wish the collar would save the stim setting. Kinda of a pain when 1 dog needs a 5 stim setting, and the other one only needs a 2. Thanks. Tri-Tronics is a product that I have used for 35 years. Made a mistake and bought a Sport Dog when I had two new dogs to train since my tri-tronics collar needed new batteries and were no longer made for my A-70. I purchased the Sport Dog since it was small and the reviews seemed to fit my needs. Surprise, this is not a very good product, and the Sport Dog I would not recommend for anyone wanting to seriously train a dog. Very disappointed with the Sport Dog Collar and have only used a few times, and now it is in my not used box. I purchased my new Tri-Tronics collar from Steve only because of the level of service I have received for many years and recommend his company above all others. My mistake was buying a Sport Dog and not staying with a product that I had used for many years. Thanks, Dan Miller, Alamo Sporting Dogs. Easy to use. Very intuitive. As Steve has demonstrated in his video, this device can be used by touch without having to look at the controls. Great new product, similar to the Tri Tronics Flyway series. Easy to use, built in bark collar is great, and addition of collar light fantastic when location your dog in low light situations. I have used other collars and none have provided the ease of use, adjustability and ease in training situations that this unit has. "Works wonderfully for my dogs." Works wonderfully for my dogs. I have used this for several weeks now and love the ability to send a 'Tone' to each dog followed up by a Vibration and/or Stimulation. For my dogs, I rarely get to stimulation before they respond to commands. Another beautiful feature are the LED lights on the collar that can be turned on and off for each dog from the handheld device. I am out with the dogs very often after dark and provides a good visual for me and others. The collars also double as a bark collar which works well and supplies me with an indication as to if and how many corrections the dogs received when in bark mode. If you can swing the price, this is a great device. "Great place to do business." Steve is always excellent on getting orders shipped fast and at a reasonable price. Steve has always answered questions through e-mail super-fast and knowledgeable. Great place to do business. Really a nice unit. Both dogs respond very well. Our Shepherd has yet to need more than vibrate, but the Lab is a bit more rambunctious. The video from the website was a huge help in my selection and is highly recommended for newbies like me when buying something like this. "Easy to use, bark mode is effective." Easy to use, bark mode is effective. Intuitive controls. "Very satisfied with their products and service." Excellent Co to do business with. Very satisfied with their products and service. have been using the Garmin 550 for a few weeks and so far I love it!really like Steve's video explaining use and operation. "This absolutely is the easiest to train your dog with." Everything works great. It has really helped calm down both dogs and even though they still run the fence line with dogs on the other side, they are no longer barking. The only thing I wished this product had is the ability to leave the collar on the bark setting and still use the handheld unit. Other than that it is a great product, and we love it very much. "I have attentive and focused dogs!" Interactions with livestock and wildlife are no longer negative. I have attentive and focused dogs! This is my forth Tri-tronics, 2 dog collar, beginning with my first collar in the 70's, then a G-2 and a G-3. There are several things that I like about the Pro 550. The lighter weight, The sound of the tone, the vibration setting. Thanks again for getting the collar to me so quickly. Had a Sports G3 before. The 550 is taking a bit of getting used to, but so far it great. I liked the Tritronics version better because I did not have to move a switch from momentary to continuous. Looks more complicated than it is. Dogs respond really well to beep and vibrate. Haven't used shock yet at all. Love the light. Only thing I'd consider an improvement is a quick release clasp collar. The straps on the receivers are too small in width and too flimsy. The toggle switch on the transmitter is too small. The pro 500 setup is all around better. It has a very poor strap with no D ring as all previous Tri-tronics collars had.